With the holidays approaching and so many amazing things wrapping up here at Theatre Direct, it has truly been an inspiring last couple months. Two weeks ago, we had Jacqui Russell, the Artistic Director of the Chicago Children’s Theatre, was here at Theatre Direct to work on a special Toronto Initiative of the infamous Red Kite project. The Red Kite project was originally pioneered between the Chicago Children’s Theatre and Oily Cart in the UK to create a theatrical experience for children with autism. Since its incredibly successful inception, a new partnership was forged between The Chicago Children’s Theatre and Theatre Direct so that a Toronto creation could be generated in a week long training and workshop. Upon Jacqui and her colleague Dawn’s arrival there was not a day that passed by that was not inspirational. We learned about children on the autism spectrum, the development that Chicago Children’s Theatre went through creating Red Kite, and some of the amazing sensory based experiences we [the Toronto team] would be creating. On the Tuesday we were lucky enough to visit the truly exceptional Beverley School and meet with 16 lovely children [with autism spectrum disorder] who would be joining us on the Friday for the performance. I myself have been involved with children in a teaching capacity for about 10 years; however, this was really the first time that I had gotten to watch what it means to facilitate a drama class with a group of children who were all on the autism spectrum. It was magical and challenging and like nothing I have ever been witness to. It was really a unique experience to be witness to Jacqui Russell leading “drama time” with the kids. The following days were all about creation work amongst the actors, director and designer, and learning the ticks of the trade on the educational front of producing shows for both family and school audiences. The amount of personalization, attention to details, thoughtfulness and really…love that goes into these shows from beginning to end, from the actors to the administrators, is really something extraordinary. Also – an equally surprising part of the week was when we brought a few different test audiences of early years aged children (3 – 5 year olds) and how effective and engaging the piece of theatre was for their age group. Also here at Theatre Direct, it was the final week of the fall session of our wonderful Wednesday Ensemble that I am lucky enough to teach. The last 9 weeks that we have been together has been full of focus exercises, movement work, tableaus, story writing, story acting, and character creation, which culminated in a lovely short sharing with the friends and families of our participants. In our sharing the members of the ensemble wrote short Cinquain poems based on one of the four seasons, to which they proceeded to choreograph movement, gestures, or frozen poses. After which, they taught the movement to their peers and it was all set to some beautiful music to meld it into one large text/movement piece. They all did such an incredible job and so many personal achievements were met that day, and over the course of our fall session. I am really looking forward to our Winter session together. So, UNTIL THEN! From November 25 – 30, 2013, Theatre Direct Canada partnered with The Chicago Children’s Theatre to bring Artistic Director Jacqueline Russell and production manager Dawn Akelis to Toronto with the aim of creating a scratch performance for children with autism spectrum disorder (ASD). “Red Kite” is the title of an exciting series of multi-sensory theatrical experiences for children with ASD. Developed by Jacqueline Russell, Red Kite performances are created for small audiences of no more than 10 children and encourage direct interaction between the audience and the performers. A complex and multifaceted disorder, autism presents differently in each person who is on the spectrum. But one generalization that can usually be made is that children with ASD respond to sensory experiences. Because of this, Red Kite projects are built of sensory events, with little dialogue or narrative story. Under Jacqui and Dawn’s expertise and guidance, Theatre Direct’s goal was to train a group of artists in the methodology behind creating a Red Kite play. The other fundamental partner in this project was Beverley School, a Toronto public school dedicated to supporting the needs of children with developmental and/or physical disabilities. Working with teacher Linda McLaverty, we arranged to go to Beverley School to meet the children with ASD who would be our audience. At Beverley School, Jacqui led the children through a drama class. Theatre Direct Artistic Director Lynda Hill had worked with this group throughout the fall, so the children were somewhat familiar with the concept. For the Red Kite team, however, this was our first introduction to our audience and their first introduction to us. It gave us a chance to see how they responded and to understand Jacqui’s methodology. After our morning at Beverley School, the project became specific. We knew who we were designing the piece for. They were individuals and we and busily learned their names, their likes, their dislikes. Over the course of the next three days, Jacqui fleshed out a framework for the show. The boxes were packing boxes. A family had just moved into a new house and the children in the family are having a hard time going to sleep – they wanted to keep exploring the boxes and find treasures. A series of sensory events were developed, each bracketed by “Papa Tim” trying to get the children to sleep. A pillow fight, dance party, flashlights in a tent, a car wash – all created with textures, sounds, lights. The culmination was a lullaby and the whole theatre space filling with stars – points of light gently moving outward. It was a calm, dream-state event that filled everyone with wonder. “Red Kite, Brown Box” was born. In addition to the play, we created an art installation. Since the children were in two groups, one group would view the play while the other explored the installation at their own pace. Because the play took place in a “house”, we decided that the installation would be the “garden” right outside the house. Creating the Garden was like building a whole other show. We used the same principles as we did for the theatre piece (sensory experiences), but in this case the children would be the ones to find and discover things on their own. No one could predict how the kids would respond. When the time came, everything was predictably unpredictable, just as Jacqui and Dawn said it would be. In the garden, a child dove into the tent and played happily with a pile of crayons for fifteen minutes. Another crumbled a pile of dried leaves and pinecones. One ran erratically. One had a meltdown. One shredded all of the paper boats in the water pool. All behaviours were acceptable. We were fascinated by what captured their attention, and what did not. Each child responded differently and what appealed to one child was often disregarded by another. The “Smile Family” came out into the garden and guided children into the “house” (the theatre) as they sang the song “Our House”. Each actor was responsible for two children and helped them into their own bed/chair built out of a cardboard box. The bed was a home base, but the children weren’t expected to necessarily stay in it. The play then became a series of negotiations and offers that guided the children’s engagement: “Hey, why not hit me with the pillow, instead of hitting the light?” “Would you look after this bedtime bear?” “Do you want to take your car through the car wash?” “Dance Party!” It was the most intense, exacting and in the moment theatre I have ever seen. After the children left, and we had a chance to de-brief, everyone on the team overflowed with excitement. We wanted to see those kids again, right away, to have the opportunity to perform for them, be surprised by them, learn from them. From the perspective of the teachers and caregivers from Beverley School, the students were amazingly engaged, and had had a number of breakthroughs in which they expanded their repertoire of responses. It is hard to convey how unique and moving this project was. It was work that stretched us all as artists, and as people. What an incredibly full month it has been here at Theatre Direct. I got to spend a week with Rhona Mattheson from Starcatchers where we had extensive talks about early years work with Storytellers, artists, and many other professionals in the creative community. My favorite part of her visit was the talk given that Theatre Direct organized at the Ontario Arts Council. It was just such an amazing experience to be in a room full of such a diverse group of people interested in what creating art for the early years means, how important it is, and engaging in conversation about it. Another highlight this month was getting to visit the Fraser Mustard Early Learning Academy on two separate occasions. Once was to tour the brand new building, made with the utmost thought and detail for the approximately 700 kindergarten students who go to school there in the Thorncliffe Community. The building is truly immaculate. It’s one of the most inspired buildings I have ever seen because every inch was designed with the thought “how can this benefit the 4 and 5 year old’s who will be attending” from the coded numbers and letters on the outside of the building – to the ramps and soft play atrium area on the inside. It’s honestly amazing. The second trip to Fraser Mustard was to do a teacher training in preparation for a very large residency project – The Firefly Project – that Theatre Direct is facilitating at the school. Watching Lynda Hill speak about the vision of the project, and run exercises with the teachers got me excited to be able to observe this massive and important project. The teacher training drama workshop also got me thinking about the fast approaching beginning of Drama School here at Theatre Direct. I will be teaching a 3-term long after school program called the Wednesday Ensemble for children grade 3 – 6. After having worked intensively with children full time for 12 weeks this last summer at Seattle Children’s Theatre, it was nice to have a break and to be in the office aiding in coordinating education programs… but I am definitely now anxiously awaiting the beginning of my program. I miss the kids!!! Also Saturday morning drama club begins the same week and I will be observing Lynda in her class with the JK-SK’s to see some early years work in action! Theatre for the very, very young. 90% of a child’s brain is developed in the first three years. With this in mind, Starcatchers focuses on theatre for the very, very young. Actually, they start with pre-birth theatre projects, working with expectant mothers on creative engagement. “If a mother is creatively involved she will be less stressed. That means the baby in her womb will be less stressed. So already the baby is benefiting from the arts,” says Rhona with her broad smile. The Scottish government has a stated aim to be the “best place to grow up. A nation which values play as a life-enhancing daily experience for all of our children and young people…” The document “Play Strategy for Scotland” is based on cutting edge research into the importance of play for the developing brain. “Play” is considered a basic human right, as is the right to enjoy art. Article 31 of the UN Convention of the Rights of the Child states: Children have the right to relax and play, and to join in a wide range of cultural, artistic and other recreational activities. Starcatchers works from that basic right, the right to play and to enjoy artistic activities. In fact, who better than artists to create inspiring works that use play? And with 700 new neural connections being built per second in the first year of life, offering artistic experiences for babies has become a mission for Rhona. While theatre for Early Years is a well-respected field internationally, dedicating arts experiences for babies and toddlers is almost unknown in Canada. Rhona’s visit to Toronto was an opportunity for Theatre Direct excite and engage local theatre artists, educational leaders and policy makers in the idea of developing and providing playful artistic experiences for babies and toddlers. Fraser Mustard Academy is dedicated to respecting the child, and everything is built for their perspective. There are large open spaces for physical activity, dance, and even riding tricycles. You can see the inner workings of the building. Pipes, tubes and electrical wires are left visible because “we want kids to see how things work,” says principal Catherine Ure. Theatre Direct well understands the vital role of creativity in play-based learning. The company is partnering with the Fraser Mustard Academy to offer a series of artists’ residencies. The Firefly Project will take creative drama and story telling into all of the 24 kindergarten classes over the course of the year. With new works in development for babies, toddlers and 3 – 5 year olds, it is a really exciting time to be at Theatre Direct. Just as young brains are developing, Theatre Direct will be there with inspiring and creative sounds, colours, movements, textures and wonder. 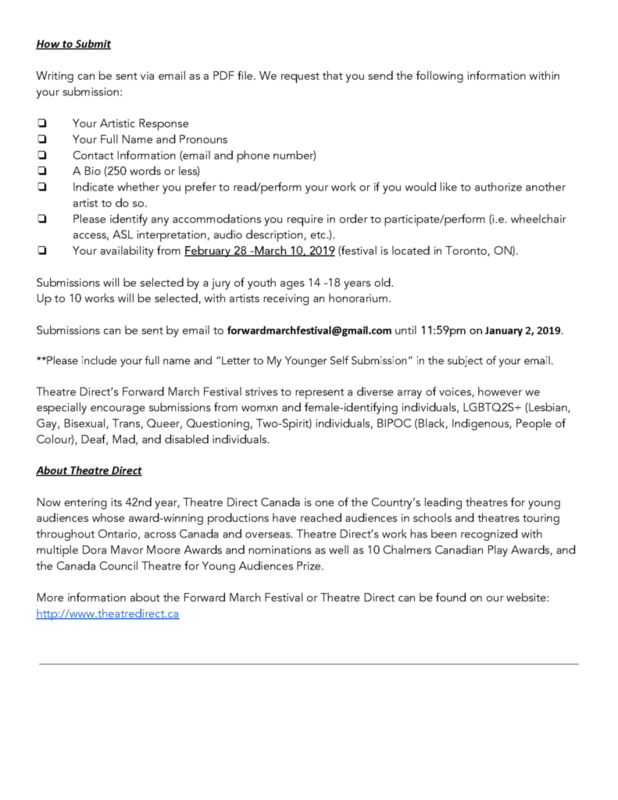 Next May, Theatre Direct is launching The Wee Festival, the first festival of work for the very young in English Canada. It promises to be a joyful and playful time for all. Hello Theatre Direct friends, families, and educators! One fateful afternoon – June 20th 2013, to be exact! – I received an amazing e-mail that informed me that the Metcalf Foundation had given me the Performing Arts Internship grant. This wonderful opportunity meant that I was going to be interning at Theatre Direct for an entire year with Artistic Director Lynda Hill as my mentor. Children’s Theatre and drama education is what I love so being here truly feels like the right fit. Now that my first week is well on its way, I am even more excited than I was to start. Transitions into new projects are always a major adjustment as I always want to know how to do everything immediately without needing help, which I know is unrealistic. However, Lynda and Naz have made our work place an incredibly positive, generous and open space that asking my millions of questions has felt easy. This week, Rhona Matheson has joined us from Edinburgh- based Starcatchers and it is such an interesting opportunity to learn about early years work that is being developed abroad. 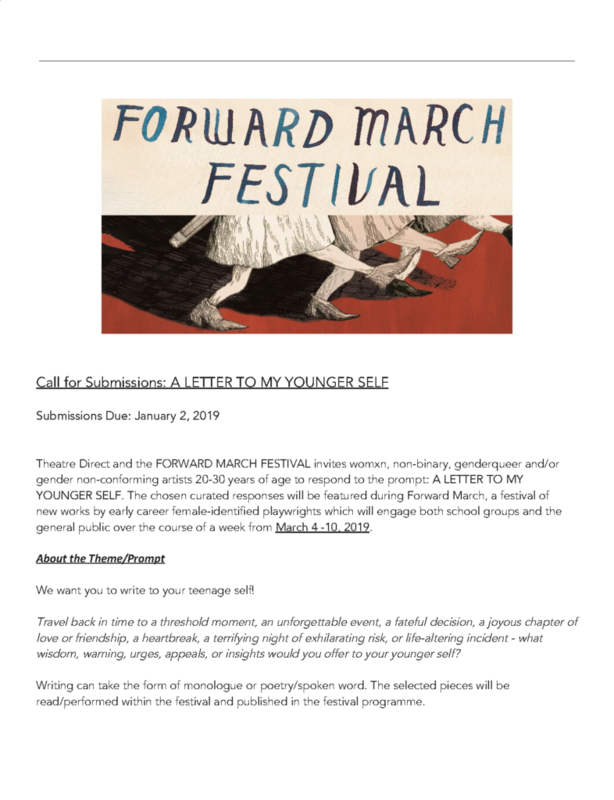 Please keep an eye out in our Newsletter and Blog for more excerpts from my experiences as an intern here at Theatre Direct this 2013/2014 season! 1. How do you make the fleas perform? First, the fleas are not “made” to perform. They do so voluntarily because they love to be in the lime-light. I audition fleas from across the country, and young larva come from far and wide to participate in our renowned circus. The successful fleas, the ones with sparkle and that certain, show-business “It”, undergo a lengthy training and conditioning process, to learn their various acts. Like people, fleas are individuals with individual talents. A juggling flea, for example, might make a terrible strong flea. An educated flea might be great at mathematics, but lousy at ballet dancing. Each flea is placed in the act that best exploits their natural abilities. 2. What’s the best trick you’ve ever taught a flea? About ten years ago, one of my tightrope fleas hurt four of his legs and had to go into early retirement. He was a gifted learner, so I trained him to do my housekeeping chores. Vacuuming, dusting, a little ironing. He loved to brew my morning coffee too. I never had the heart to tell him he made it too darn strong. 3. Have you thought of using other insects in your circus or are you strictly a flea trainer? The relative strength and longevity of the pulex irratans, or the Human Flea, make them ideally suited for show business. However, I once tried to train a grasshopper to chirp on command thinking her musical accompaniment would make a clever addition to the circus. Sadly, she was terribly lazy and shiftless, and eventually ran off to live with some industrious ants. I’m not sure how she fared. After the winter came, we never heard from her again. 4. When you travel, how does the production travel together? Does everyone get their own sleeping quarters? Most of our fleas travel together in the same Empty Candy Inn. However, our star attractions often negotiate their own match box. During the off season, when shows are scarce, they like to holiday together on the back of a mangy old Cockerspaniel named Jethro. And of course, mealtimes the fleas gather together and nibble on my left arm. 5. What’s the next tour stop for you and the fleas? I think they’d be a huge success in Russia! Funny you should mention. But the first known flea circus is said to have occurred in a Siberian prison in the 1500s, where inmates trained fleas to race and pulls small pieces of refuse along little makeshift tracks. 6. How did you get into flea training? Who did you learn the trade from? Well, I could answer that question. However, that is the subject of my autobiographical play, “Buster Canfield and his Amazing Fleas” which can be seen in a special, advanced sneak preview presented by Theatre Direct at the Artscape Wynchwood Barns, on March 16th! Thank you to all who expressed interest in our January 11th Day Camp. The camp is now full. Baby it’s cold outside – so grab yourself some Hot Cocoa! 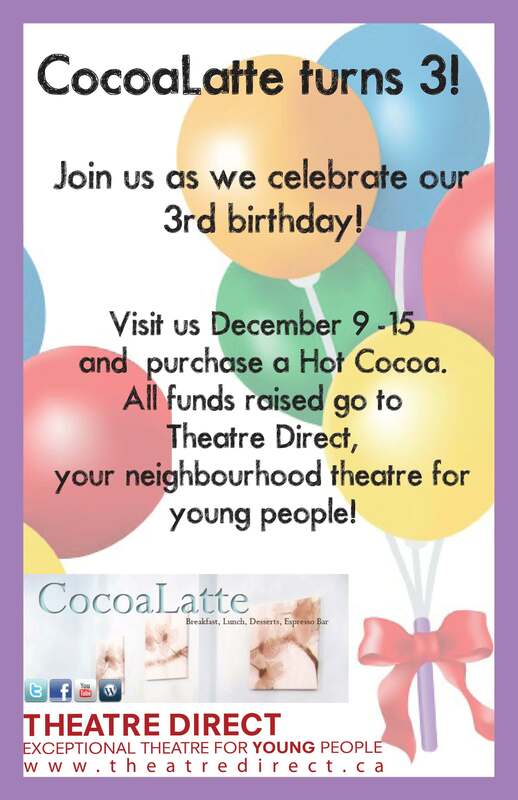 Between December 9 – 15, warm up by purchasing a Hot Cocoa and help support Theatre Direct while celebrating CocoaLatte’s 3rd birthday! Join us on November 10th at 4:00 pm for a benefit performance of Head à Tête, followed by a light family friendly reception. Tickets are $10 for a child and $20 for an adult. All proceeds go to our Lights Up!Drama School Bursary Fund. Head à Tête is a show perfect for the whole family – best enjoyed by those 3 ½ and older.